The very solid supporters of Senator Bongbong Marcos filed the criminal case on behalf of their vice presidential candidate. The Marcos's camp files complaints against the Smartmatic project director. On Friday, May 20, Atty. 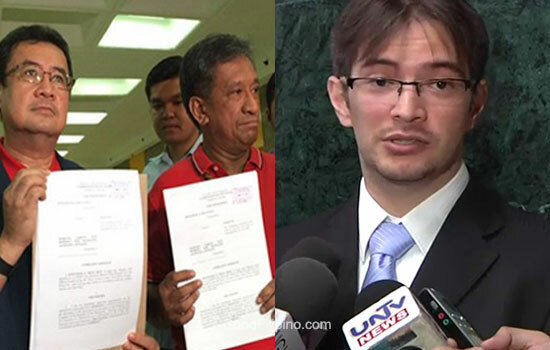 Jose Amorado and Jonathan de la Cruz filed the case on Marcos' behalf. Marlon Garcia, Smartmatic project head, allegedly violating RA 9369 or the Automated Election System Law, according to them. De la Cruz said, "Hindi naman pinag-uusapan dito ang dayaan. Ang gusto namin malaman, anong nangyari? (We're not talking about alleged cheating here. What we want to know is what happened? )" They claimed that they have already collected evidence of cheating by the opponent camp of Camarines Sur Rep. Leni Robredo. "Kung pag-uusapan ang dayaan, marami kaming ebidensya diyan,(If we're talking about cheating, we have a lots of evidence for that)" Dela Cruz added. According to news, Marlon Garcia allegedly inserted a new script in COMELEC's transparency server on the night of the elections, after which Marcos claimed his votes began to trim down,"
"The COMELEC had stated that the script was only tweaked to correct the "ñ" character in the names of the candidates, and maintained that it did not affect the vote results." De la Cruz however mentioned that there might be other breaches of protocol that were not caught or told. "Ito lang ang nakita eh. Baka may iba pa,(This is only what they saw. Maybe there's more)" he said. Meanwhile, the senators' supporters were already outside the building to show their support before Marcos' lawyers arrived at COMELEC to file the complaint. What do you think guys, do they have the means to complain? Please share your thoughts below. Comments or suggestions about "Bongbong's camp filed criminal case against Smartmatic's Marlon Garcia " is important to us, you may share it by using the comment box below.